Published on February 27, 2010 in General T&T, Parliament, Politics and UNC. 1 Comment Tags: Basdeo Panday, Jack Warner, Kamla Persad-Bissessar, UNC. 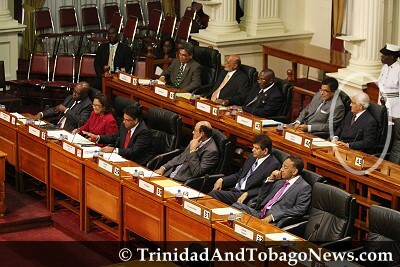 Former Opposition Leader Basdeo Panday yesterday defied the order of UNC chief whip Jack Warner and stuck to his word to occupy a backbench seat in the Parliament yesterday. FORMER Opposition Leader, Couva North MP Basdeo Panday, sat on the Opposition back- bench yesterday, ignoring a call by his successor Kamla Persad-Bissessar to stay on the front bench next to her. Former opposition leader Basdeo Panday yesterday sat on the Opposition back bench of the Parliament and received more warmth and recognition from the PNM, including from Prime Minister Patrick Manning, than from his own MPs. And history was created as UNC Political Leader Kamla Persad-Bissessar occupied the seat of the Opposition Leader in the House. KAMLA Persad-Bissessar’s appointment this week as Leader of the Opposition has rightly been hailed by business and professional groups, as well as by ordinary citizens as an achievement, a special moment in the country’s continuing development. UNC Senator Wade Mark will breathe a sigh of relief when he enters the Senate today, after being retained in the UNC’s Senate team by Opposition Leader Kamla Persad-Bissessar. Opposition Leader Kamla Persad-Bissessar yesterday appointed six senators, acting independently of United National Congress (UNC) chairman, Jack Warner, who had opposed the decision to reappoint Wade Mark. CONGRESS of the People (COP) member and former UNC government minister Mervyn Assam returns to active politics this time as one of several new faces on the Opposition senatorial line-up.